The Russian leader made an appeal for countries to continue investing in Russia and promised that Russia will recognize the outcome of the May 25 elections in Ukraine. Speaking at the St. Petersburg Economic Forum, Russian President Vladimir Putin urged international partners to stay in Russia, promised not to restrict Facebook and Twitter, and announced his readiness to recognize presidential elections in Ukraine and work with the new authorities in Kiev. The Russian president promised to provide assistance to foreign investors in Russia. "A very simple appeal and a very simple message - think about the benefits and possible dividends from working in Russia and do not give in to pressure and blackmail," Putin said when asked to address the business community. According to him, in the near future, Russia will start a process aimed at making doing business in the country easier. Later in 2014, the State Duma will introduce a package of five bills to improve the business environment in Russia. “An investor won’t wait. It needs the most favorable conditions for work today, not sometimes in the future,” the president said. The authorities hope that the move will propel Russia among the 20 countries with the best investment climate by 2018. When asked whether Facebook, Twitter and their Russian analogues could face closure in Russia, Putin rejected such a possibility for Russia. "First of all, we are not going to shut anything down. Secondly, we do not consider ourselves entitled to criticize those who are doing so. In any case, the situation has a national aspect that is unique, and it is not for us to judge who does what and how,” he said. Putin also said that the sanctions imposed by the western countries over the situation in Ukraine will not inflict damage on the Russian economy. "All these things currently do not have a systemic negative effect on our economy, and I hope they won't," Putin said. Putin also directed some harsh comments towards the U.S., postulating that the sanctions might conceal ulterior motives connected with its economic interests. "By insisting on sanctions against Russia, I suspect that our American friends – and they are shrewd guys – may wish to gain certain competitive advantages in their trade and economic relations with Europe," he said. One of the main issues touched upon by the president in his speech was the crisis in Ukraine. Putin said he hopes that all military action will end in Ukraine after the presidential elections. According to him, Russia is prepared to work with the new power structures in Ukraine after the elections. "We are already working with people in office and we will certainly be prepared to work with the new authorities after the election,” he commented. Putin pointed out that the Russian authorities hope to reach an agreement with Ukraine over the gas payment dispute. He also addressed the diversity of opinions between Russia and the U.S. regarding Ukraine. The Russian president said that Washington's position as regards the ongoing events in Ukraine is due to the fact that said events are not vitally important for the U.S., in the way they are for Russia. Putin also discussed the detention and questioning of Russian journalists by the special services in Ukraine, especially before elections, describing them as unacceptable. 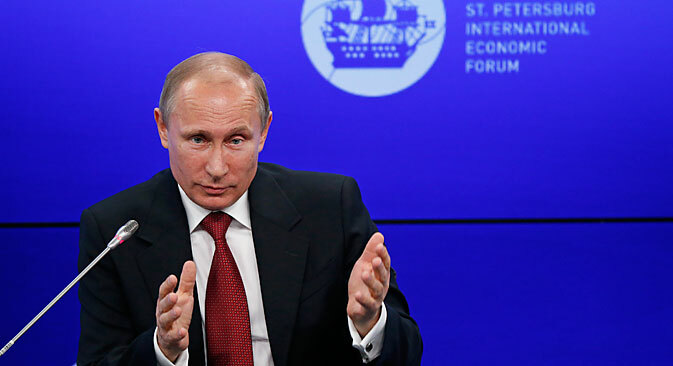 Speaking at SPIEF, Putin promised that by fall 2014 Russia will develop a strategy for import substitution. "By means of industrial modernization, construction of new enterprises and competitive localization of production in Russia, we can significantly reduce imports in many areas and return our market to domestic producers, without violating international trade rules and without introducing any restrictions and barriers," he said. The move is expected to concern primarily software, electronic equipment, textiles and the food market. Putin added that a complete package of measures will be developed to support domestic enterprises. A special fund for the development of the Russian industry will be set up as well. In response to Putin's speech, the rate of the ruble registered growth. Former finance minister Alexei Kudrin welcomed the president’s comments on Ukraine and Russia's relations with the West. "We understand that this are still assumptions, expectations and desire, but today there is more hope that the situation will be settled, and we will all be back to a normal work flow," Kudrin said after Putin's speach. The St. Petersburg Economic Forum is taking place amid strained relations between Russia, the United States and the European Union. As a result, heads of many international corporations have refused to participate in the event. According to the New York Times, U.S. President Barack Obama urged leaders of American corporations not to attend the event. According to Deputy Minister of Economic Development of Russia Sergey Belyakov, about 15 percent of the companies who had previously registered failed to show up for the forum.